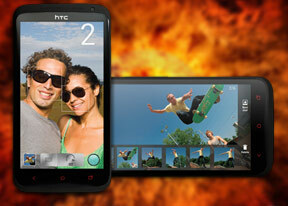 The HTC One X+ packs quad-band GSM/GPRS/EDGE and quad-band 3G with HSDPA speeds up to 21Mbps and HSUPA up to 5.76Mbps. The local wireless connectivity has Wi-Fi b/g/n and full DLNA support (both client and server, for images, videos and music) and Bluetooth 4.0. There is no death grip problem we saw haunting some HTC devices of old so there's nothing to worry about. Wi-Fi reception is strong, as is the cell signal. The HTC One X+ comes with an MHL port, so if you plug a MHL dongle in, you can output HD video over a standard HDMI connection. The phone's UI is mirrored on the TV and with the HD resolution of the display, watching on an HDTV is a joyful experience. HTC One X+ comes with the latest version of the Android web browser. Coupled with the HD display and powerful chipset of the One X+, the Jelly Bean web browser performs impressively well. Most of its UI is out of sight, leaving the entire screen to the web page. And even when it does appear it consists of a single bar, which now holds the address field, the Tabs and Menu dropdown shortcuts. You might want to enable Quick controls - they let you tap on any point on the edge of the screen and move your finger to select the desired option from a jog-dial menu. Tabs can be only closed with an X button on their top right corner - they can't be swiped off the screen like you do in the app switcher. Incognito tabs are available if you want to browse without leaving traces. The Menu options include a toggle to enable/disable Flash (yes, Flash is supported out of the box within the HTC's implementation of Jelly Bean) and another one to request the desktop version of a site, instead of the mobile one. Another cool feature is preloading search results that the phone believes are relevant, speeding up the whole process. The HTC One X+ played Flash videos effortlessly and Flash games were no problem either (as long as you find one that works nice on a touchscreen device). The HTC One X+ features the usual set of organizer applications, with a mobile Office app, capable of both editing and viewing documents. The Polaris app has support for viewing PDF, Word, Excel, and PowerPoint, including the Office 2007 versions and it can create Office 2003 Word, Excel documents and presentations. You can format the style and color of text, as well as justify it, do lists (numbered or bullet points) and that's about it for the Word editor. The Excel editor does support function editing, which some mobile editors don't. The HTC One X+ features an alarm clock application, which can handle multiple alarms, each with its own start and repeat time. You also get a stopwatch and a timer in the same app. The Stocks application gives you quotes from Yahoo finance. You can use the Stocks lockscreen too. The Voice recorder is quite useful for making audio notes and the weather app brings Yahoo's weather forecast for your area a click away. There's an HTC-branded flashlight app too - it uses the LED flash and you can set it to 3 levels of intensity. Nice and all, but the Android Market is full of this kind of app already. HTC Notes app is also onboard. It is somewhat similar to Samsung's S Note - you can take various notes, add drawings, pictures and dictations. Sharing and printing options are also available. There is HTC Tasks app as well. It does exactly what the name suggests and can access your Google Tasks. Another HTC exclusive app you get is the Movie Editor, which lets you create your own videos from scratch, by adding images, clips and selecting a theme and soundtrack.